Welcome to my second blog! This blog will focus on the love story between my brother, Scott, and his girlfriend, Maddy, and how it led to a proposal on June 29, 2018. I am so, so happy I could be there to capture this moment and this day. Let’s go back to day one to give some back story. Scott and Maddy started dating their senior year of high school. Scott had a crush on Maddy when they spent time together during rehearsal for the spring musical, Grease. Scott decided to ask Maddy to prom. After she said yes to his creative request, Scott and Maddy began to spend time together. A week before prom, Scott asked Maddy to be his girlfriend, which appeared to please prom attendees; on the night of prom, Scott and Maddy were voted prom king and queen! After graduating from high school, Scott and Maddy attended the local community college together and then transferred to universities in the Los Angeles area, ultimately earning Bachelor of Arts degrees from Azusa Pacific University. Scott applied to and was then accepted as one of two master students at San Diego State University. And for Maddy to complete her educational goals of earning a Masters in Education and a teaching credential, she applied to and was accepted into the University of Southern California's online credential program. Maddy then moved to San Diego to be close to Scott. With only one more semester left in Maddy's program, and two years to complete in Scott's program, Scott decided it was time to further commit to his first love. They planned a friend trip to Maddy’s family lake house for the weekend in late June. Scott prepared to propose to Maddy and she had no idea. As part of the plan, I begged the group to take photos on day two of the lake trip. This is almost expected for me to do. I took photos of each couple, and then it was Scott and Maddy’s turn. Scroll down to see the proposal unfold. I asked Scott and Maddy to face away. Scott stood with his hand open when Marlee, Maddy's sister ran and handed him the ring box that he custom made. Maddy had no idea that he was holding the ring box as they took these photos. 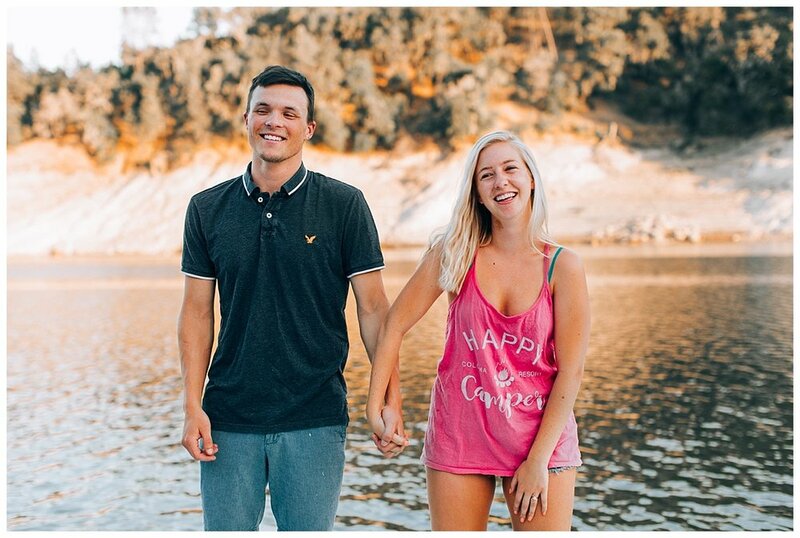 Maddy told Scott that the lake would be the perfect place to propose, but he told her he had something else planned for later in the summer. As they stood there, he told her that she was right; the lake would be the best place for him to propose. He then got down on one knee. After six years of dating, Scott proposed. Maddy obviously liked the ring. Maddy teared up as Scott placed the ring on Maddy's finger. Excitement is an understatement. I think she might have blacked out due to her happiness. Friends and siblings shared in the celebration. Parents watched from the top of the cliff above the lake. Maddy was so surprised and excited that they were there to share this moment. The ring... and the beautifully made box! Cheers to the newly engaged couple!